It was raining heavily when the inaugural SriLankan Airlines flight from Colombo touched down on the Indian Ocean archipelago nation of Seychelles and one could hardly make out the water cannon salute from inside the aircraft. As the passengers deboarded at the Seychelles International Airport on Mahe island, each of them were handed out umbrellas by ground staff waiting at the end of the stepladder to get to the small arrival terminal a few steps away. The sheer exoticness of the country will never fail to hit a first-time visitor, as this IANS correspondent was as he was transported from the airport to the resort on an island connected by a small bridge. A neat, well maintained two-lane road flanked by tropical trees — greenery in all its grandeur — connected the airport with the resort. The quaint houses on the way mostly reflected the French architectural style. One learnt later that though the Seychelles was colonised by France and later by Britain until independence in 1976, the people of the country mostly retained the French culture. Of the 115 islands that comprise the country that is around 1,500 km east of the African mainland, only the three largest ones are inhabited in a big way — Mahe, Praslin and La Digue. Mahe, the largest of them all, is home to most of the country's 93,000-odd population. A visit to the Seychelles National Botanical Gardens on Mount Fleuri on the outskirts of the capital Victoria starts with an interesting bit of trivia — a popular myth in the country is that the coconut tree has male and female forms. And that popular myth has been given official recognition as shown by the immigration stamp on the passport, the contours of which represent the female form of the tree. The wood of the Takamaka coconut tree is considered to be the most expensive in the Seychelles, according to Sandra, the guide assigned to our group of journalists. “The French extract oil from the roots of this tree and 50 ml of this is sold for 300 euros,” she said, adding that the oil is mostly used for skincare products. Landscaped and beautifully maintained , the five acres of the gardens are also home to exotic and endemic tropical plants and a variety of spice and fruit trees. Fruit bats can also be seen hanging from the trees. And then came the most anticipated event — a visit to the giant tortoises enclosure. One look and you will surely do a double take. Tortoises. Huge ones! Distributed across the Aldabra Atoll in the Seychelles, giant tortoises are herbivores that feed on leaves, fruits and low hanging tree branches. “The world's longest lived animals with a lifespan of nearly 250 years, Aldabran giant tortoises are one of the two last existing species of giant tortoises,” a board at the enclosure reads. “Their ability to survive nearly three months without food or water contributed to their vulnerable status providing live meat for ships travelling the Indian Ocean during the 16th to 18th century,” it stated. Sandra, the guide, explained that it took three days by boat to reach the Aldabra Atoll, a Unesco World Heritage Site comprising four coral islands, and only seven visitors are allowed on the atoll on any given day. After the botanical gardens, time for a tour of Victoria. Covering an area a little over 20 sq km, it must be one of the smallest and quaintest national capitals in the world. Neatly maintained two-lane streets crisscross the town which is dotted with pretty, brightly-coloured houses with slanted roofs given the tropical rain forest climate of the place, and modern commercial buildings. The Victoria Clock Tower at one of the street squares is a focal point of the town. Erected in 1903 as a memorial to Queen Victoria who died in 1901, the clock is a replica of the one erected in London in 1897. 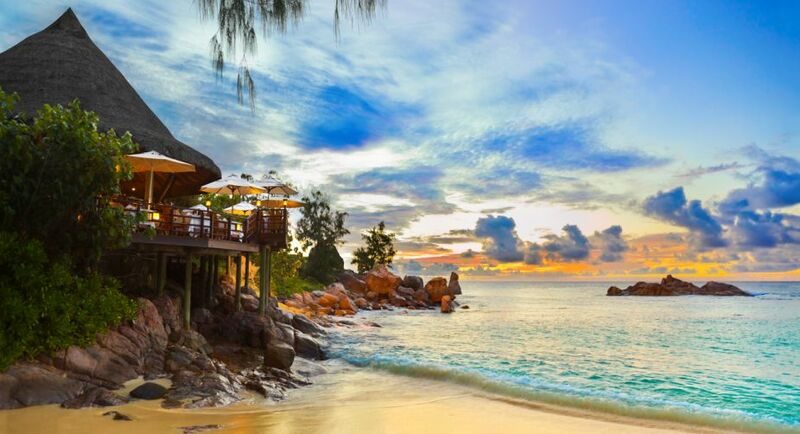 With the Seychelles as a high-end tourist destination, world's top hotel brands are all here. Beach time and Sandra immediately informed her guests that all beaches in the Seychelles were public. “That is the law,” she said. North East Point Beach is one such. Stretching over 1.5 km, the windswept beach is popular with tourists, especially surfers. Beach rocks — masses of sand that have turned into rocks under pressure — are indicative of how old the beach is. Farther ahead is the Beau Vallon beach, once considered the best beach in the world and even now among the top 10. A visit to the Seychelles is incomplete without a trip to Morne Blanc, the highest peak in the country, from where one can get spectacular panoramic views of the Indian Ocean and see tropical birds flying around. A local meal at a Creole homestead that comprised steamed sea fish, chicken curry and lentils, or dhal as they call it, completed the experience.